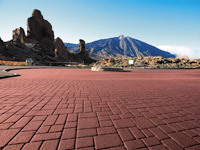 For surfaces subjected to very heavy loads (bus stops, highways, bridges) – where CreaStone, CreaBond colours come up against their technical limits. We supply coloured surface layers in more than 100 colours. It can also be used just for design. We can also print it. Conventional coloured asphalts manufactured using clear binding agents are often unsuitable for high traffic loads and suffer from thermal problems.